I had remarked that I thought the Subscribe 2 admin subscriber could do with a few tweaks. I was asked what I had in mind. So here is is – a draft idea that has been coded, tested and validated – changes offered for potential inclusion in the next version! There are a few other suggestions that have not been implemented here, however they would not be hard to add in, which I’d be happy to do if you would include them in the next version! My non-tech clients need access to their subscribers, but not the other admin features – the subscriber list must be as clean and simple as possible. 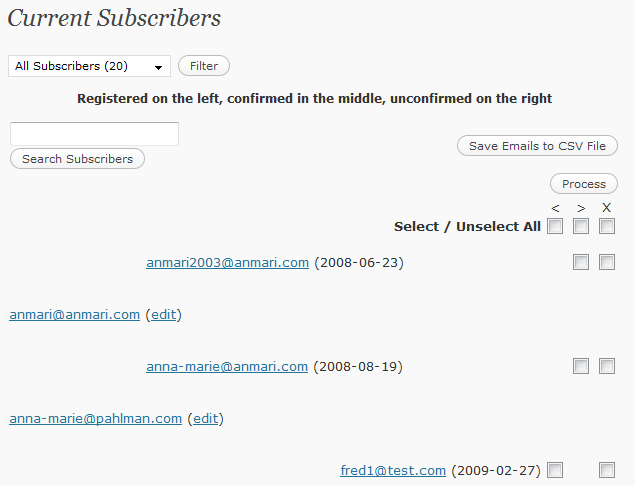 The S2 subscriber list should be consistent with the wordpress user list and the look and feel of the processing should be similar. An alternative – tested and validated! I have made and tested most of the necessary changes, and commented with /* amr */. The code has been validated. 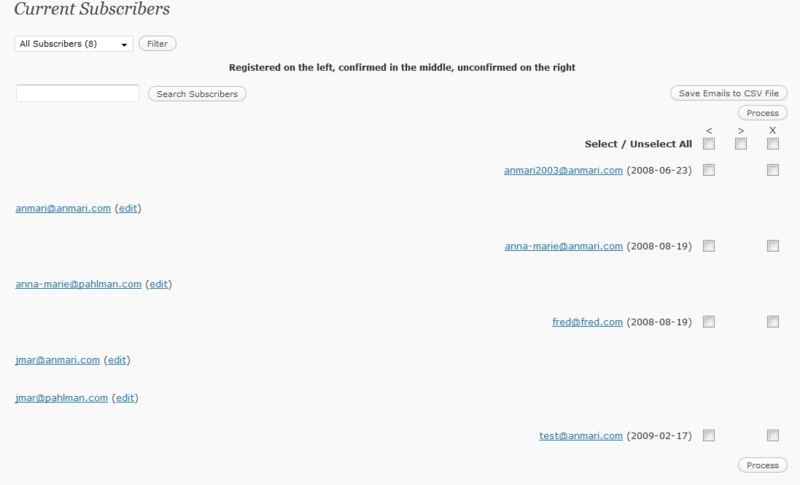 Changed default first view to be unconfirmed to highlight them and so that the “send reminder email” button will show. Also though these more NB than the full list. Changed $urlpath to use wp-config’s WP_CONTENT_URL. 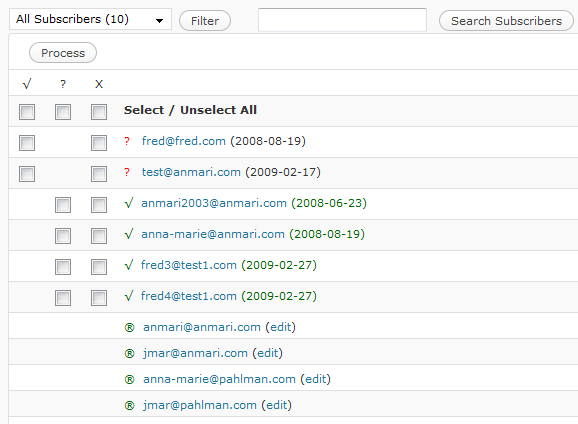 Removed the sort by name and rearranged merge so the list will sort by status, with unconfirmed first, not email. 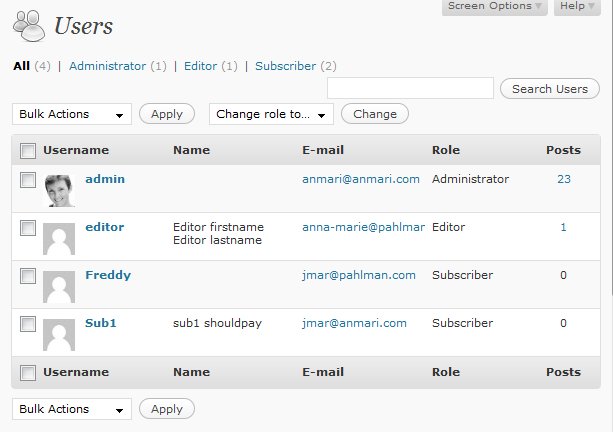 Fixed the “alternate” row css styling by using the wordpress user list css class for the table. 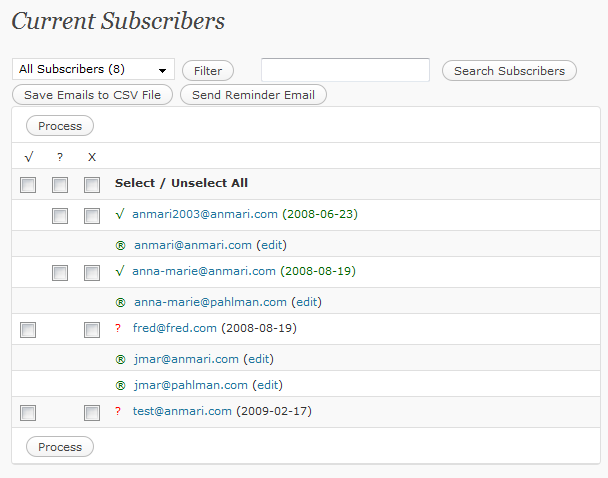 Add totals of subscriber categories as per wordpress userlist. For your convenience I have packaged up a copy of the whole alternate plugin folder. It is called subscribe2-alt1. Actually the only file affected is subscribe2.php. It will only be available here as my only aim is to assist Matthew Robinson the author, with the hope that by offering a fully tested change request, it may actually get incorporated in his next version! Navigate to Tools > Subscribers to see the difference.